DEA TORO Runway Horizontal CMM - CMM Inc. The DEA TORO is an affordable high-performance measurement system distinguished by innovative design and highly reliable mechanical structure. The DEA TORO has been designed and value-engineered to ensure accuracy, reliability and ease of use in all stages of operation, as well as maximum safety for the operator. 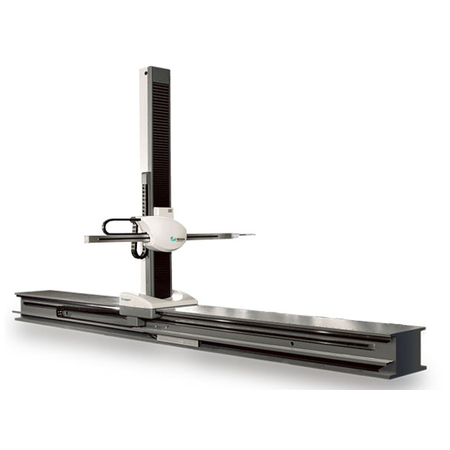 The DEA TORO is the ideal measuring tool for the dimensional inspection of large thin-walled parts such as automobile sheet metal components, sub-assemblies and full bodies, automobile glass and molded plastic parts, as well as the automatic verification of many types of prismatic parts. The DEA TORO complies with the most stringent international industry standards. Its open design allows easy access to the work pieces and easy automatic loading/unloading. The DEA TORO is available in a floor-mounted Runway-type architecture both in single or dual opposite arm configuration. All models are motor driven for complete hands-off DCC inspection and the axes are equipped with rack-and-pinion drive and linear temperature compensation, and ride on highly rigid recirculating ball pads and precisely ground, inductively hardened bearing surfaces for longer measuring life in shop floor environments. The DEA TORO is available with a variety of electronic touch trigger probes and indexing heads.